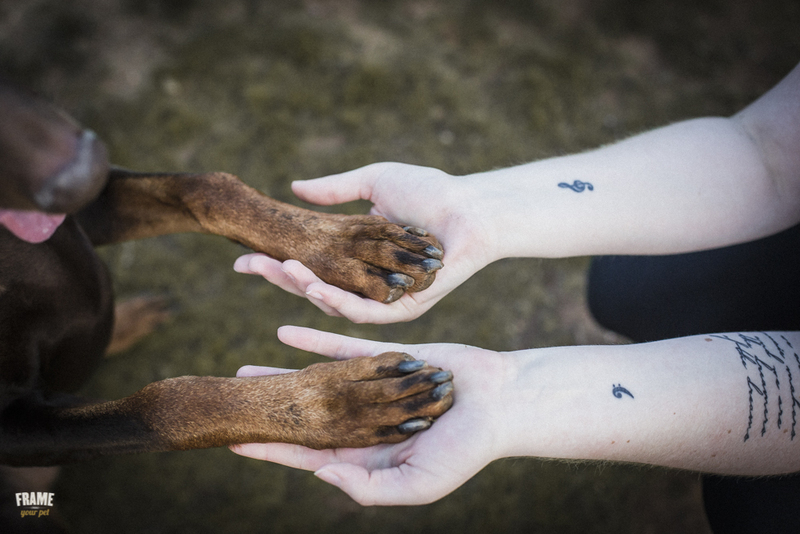 Nikki and Joey reached out to me to inquire about a Rainbow Session for their Doberman, Dakota. They had just received the news that Dakota had been diagnosed with liver disease, and they wanted to hire a dog photographer to capture her vibrant spirit. Nikki explained how Dakota is usually goofy, but she really wanted to include a fine art dog photo session to capture Dakota's more stoic side as well, so I suggested that we do the dog photography session at Vasquez Rocks in Los Angeles. This location would offer the right balance of expansive hiking trails for playful shots as well as a striking backdrop for the more solemn portraits. When I met Dakota—or, as she is more often referred to as, Kota Bear—I found it hard to believe she was sick at all! She was full of energy and acted more like a 6-month old puppy than a 6-year old dog. We started with the fine art session, and I soon learned that Dakota has a peculiar fascination with light reflections. When the sunlight would reflect off of my lens, Dakota would pounce on the spot of light! After a few adjustments—and some reflection-blocking help from her dad, Joey—I was able to capture some timeless fine art portraits of Dakota. 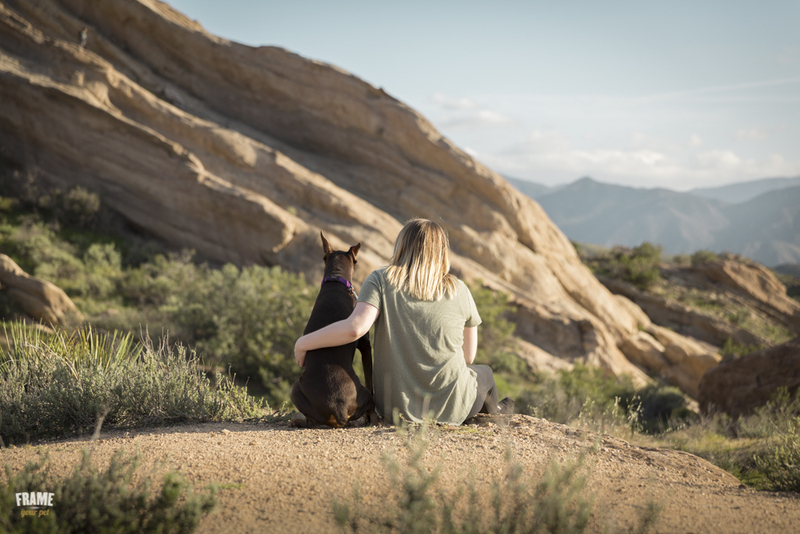 After the fine art session, we began to explore the unique rock formations at Vasquez Rocks for the lifestyle dog photography session. Dakota's bubbly and energetic personality surfaced once she saw her favorite ball come out for a game of fetch. Dakota, Nikki, and Joey wound their way through the trails, admiring the picturesque landscape and enjoying spending time together as a family. At the end of the pet lifestyle photography session, Dakota climbed onto a rock and stood as beautifully statuesque as the rocky landscape around her, giving me the opportunity to capture many stunning shots of Dakota's stoic, Doberman personality. dog photography, dog photographer, pet photographer, los angeles dog photographer, lifestyle photography, family portraits, fine art photos, landscape, animals, doberman.